This is a great par 5, the Himalayas as the members call this hole, the reason being the large mounds running across the fairway at 290 yds off the tee. This prevents drivers off the tee being used if the hole is downwind because you will run out of fairway into these mounds or the large fairway bunker to the left of them, if in these you will not advance you second shot very far. 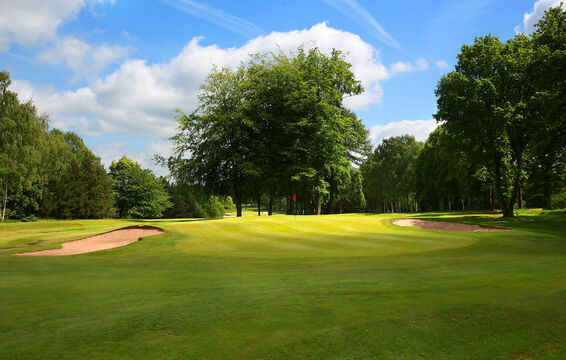 Only the biggest hitters may get home in two but it is a narrow entrance to the green with the green being at an angle and guarded by two bunkers it is not just the distance that is the difficulty. If you are playing your second shot to lay up into position it needs to be down the right hand side of the fairway to give you a better line in to the pin. Your shot in to the green needs to have the right distance control to find the right tier which runs through the middle of the green. If you are on the wrong level you will be left with a very difficult putt.